You could be forgiven for thinking that every school in the country had by now discovered the benefit of Michael Gove’s advice and rushed to become an academy. “To ask the Secretary of State for Education what proportion of state-funded primary schools have acquired academy status in each local authority. Jane wrote to the House of Commons Information Office and requested the information. 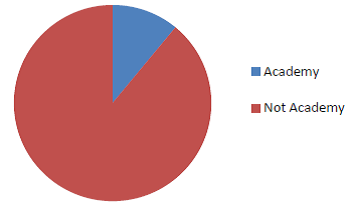 Just 11% of English Primary schools are academies, and primaries make up the vast bulk of schools. Clearly Michael Gove has a long way to go to reach his dream, and he is running out of time. Coverage: State-funded mainstream primary schools. This entry was posted in Academy watch, News, Research and tagged Primary, Statistics. Bookmark the permalink.